Posted on February 17, 2010 by Southampton Soap Co. 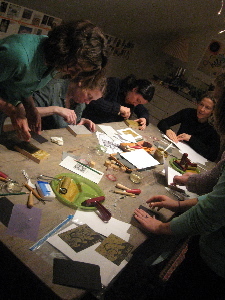 Many thanks to all the ladies who came out to the studio Monday night for our printmaking workshop. 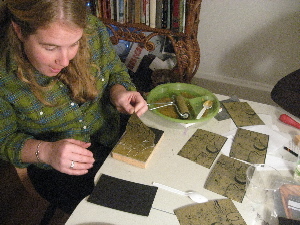 There was guided instruction in the process of linoleum cutting to create blocks which were then printed onto cards. 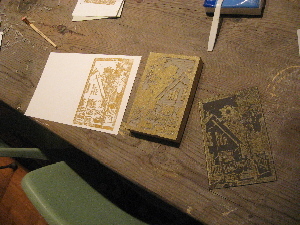 Everyone created a set of eight, and one print was more beautiful than the next. Plan your next ladies night at the studio, organize a group, bring some refreshments and have a wonderful evening with friends….call us for details! 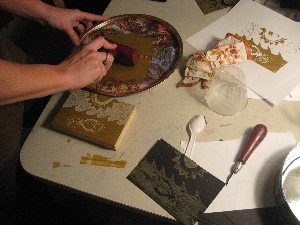 For more information and photographs of our studio, workshops and classes, visit us on FACEBOOK. Become a fan!